Did Arcade Fire Manipulate Google Into Creating An Anti-Internet Video? On the 9th of September Arcade Fire released two music videos for their new single, the heavily-hyped “Reflektor”. The first was a well shot, though admittedly straightforward, YouTube video (click the link to check it out), directed by indie music legend Anton Corbijn. However, it was the second, a collaboration between the band and Google, that really grabbed my attention. Billed as a “short film” and “virtual projection”, that allows the viewer or, more accurately, the user, to physically interact with the video, “Reflektor” marks the second time that the band have worked with Google, with “The Wilderness Downtown,” being the first. 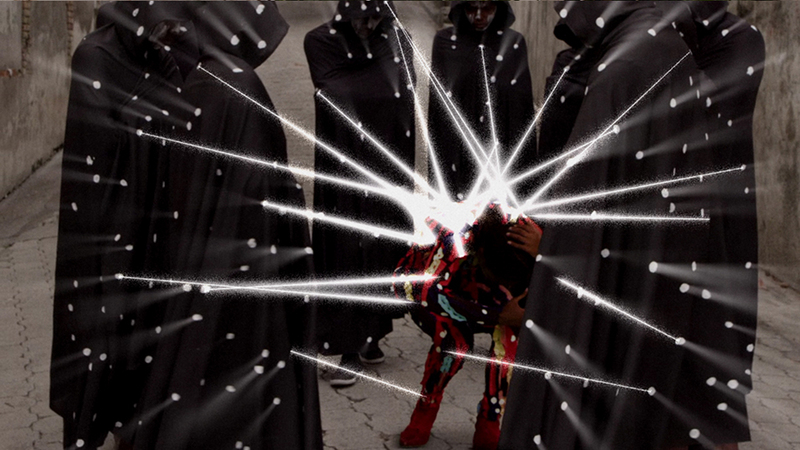 “Reflektor” takes user-interactivity much further than the first, by having users effectively be the special effects editor for the video, using a mouse or a mobile device, and also using the computer’s webcam. What was of real interest to me though wasn’t the technology or interactivity (which is what seems to have transfixed a multitude of tech bloggers and Google itself), but rather its the subtle critique of technology’s seductive pull and control evident in the song, and even the video itself. Arcade Fire implores the viewers to “break free” from their devices – even as it asks them to plug in, which as with “The Wilderness Downtown”, appears to be an uneasy, and likely intentional contradiction bound up in their use of Google to tell this story. “The Wilderness Downtown” used technology to encourage people to get off their laptops and experience the world, while “Reflektor” appears to have perversely dramatized the central tradeoff inherent in the Web. The idea of exchanging privacy for access and connectivity. You’ve got to use Google Chrome to view the video, while also ‘allowing’ Chrome to access your webcam to get the full experience. Furthermore, you’re urged to connect your smartphone or tablet to the video through the provided password. For those among you who willing and able to comply to Google’s demands, the payoff works something like this: As the music video starts, and your web cam switches on, you wave your phone around to control the screens special effects, adjusting shadow, focus, and reflections with your movements. Though for all this supposed control that you have – over the special effects and films protagonist itself, in reality this can be seen as nothing more than a mere simulacra. Google ‘allows’ you access to these features, and as interactivity itself goes, the experience is not truly all that thrilling. You’re effectively playing with light and filters across a fairly static video surface. From my reading of the video, what the Arcade Fire is trying to illuminate is that for all the supposed freedom you’re given on the internet, its a curated process controlled by others – you just don’t see it. The reality is, you’re more Axelle’s (the protagonist’s) marionette than you are the puppeteer, who in this occasion is played by tech giants like Google and Facebook. Last year, before the band had even given the creative team of Vincent Morisset and Google’s Aaron Koblin anything to work with, they started tossing around ideas for a creative film collaboration. The an initial idea tossed around was letting the viewer control a shadow puppet, in real time. Koblin, to his credit, saw the similarities between this idea and “Reflektor”, calling it “the perfect match,” especially considering the title, even if the initial idea for the puppet didn’t end up working. This insight goes some way to dismissing the tempting notion that this film is just another confused mash-up of music and corporate branding or an unintentional critique. Rather, Arcade Fire’s records are, thematically speaking, so incredibly fine-tuned, that it’s hard to believe that a contradiction as glaring as this would escape their notice. Arcade Fire’s records have always celebrated the idea of the power of refusal. Central to Funeral was the theme of walking away from the failings and crimes of your parents. With Neon Bible the band turned their gaze upon, and effectively skewered, the proclamations of mega-church conservatives and the hawkish, militant elements of the ‘Far Right’. The Suburbs went at lengths to reject consumerism and encouraged listeners to look for an alternative beyond the urban sprawl. When looking at their new album within this context, it would not be a stretch to assume that Reflektor, may well turn out to be a record that derives its focus from encouraging people to attempt to break the digital stranglehold that companies like Google have over us – a carrion call to turn off, tune out, and drop off the digital map. Let’s further unpack the evidence that the video for “Reflektor” has been executed as a high concept joke perpetrated on Google, the viewer, or both. For the video’s protagonist, the Internet exerts a kind of magical control: She dances rigidly, like a marionette, while we control the way her body refracts light, dozens of points of light pouring, from bright holes in her face – possibly signifying the thousands of screens (and people), wired to one and other, and ultimately a single, controlling, point of origin. Throughout the video, her face wears the blank expression of a screen gazer, brilliantly juxtaposed against the permutations of the bright overlay we direct. However, these bright lights, the democratizing points of connection that internet enthusiasts fawn over, become increasingly sinister as the film progresses. The initial control we are afforded by Google is replaced by a brigade of darkly clad figures, their black cloaks reflecting the lights of millions of little screens which swarm and surround her, exposing her to the same energy that we played with moments before. All that initial connectedness is later revealed to be the tool through which corporations control, coercion, subjugation people on mass. What follows next is the Arcade Fire’s most obvious critique. As a shiny tablet is held out to the protagonist, she proceeds to smashes it, and as she does, the word “BREAK FREE” flash upon the connected smartphone, the touchscreen then filling with simulated cracks. After this point, the tethered phone is unable to affect the video, it only hangs useless, nothing more than a weight tethered to a string, with the shallowness of your control being finally revealed. The protagonist, in the film’s finale, also forsakes the dark and solitary room – a symbol suggesting the spiritual emptiness of the Internet, for a crowded room of real people – flesh-and-blood musicians. The light, which once reflected through the viewers manipulation, now dances naturally off her without the viewer needing to do anything. It is in this moment, free from smartphones, or Facebook that we finally see expression on her face – she breaks into a broad smile, oozing the warmth, that the band contents, is only achieved through real interaction. So how are these images – the medium, reconciled with the message – the lyrics? It becomes clear, through looking at the lyrics, that the journey that the viewer is being taken on is the result of a deliberate thought process rather than unintended coincidence. Frontman Win Butler croons, “We’re so connected, but are we even friends?”, effectively puncturing the widely held notion that social media sites like Facebook bring us together. And though Mark Zuckerberg and co. preach on high about the ability of internet to promote friendship and connection, like a pastor at the pulpit of a mega-church, that, this is not a notion that the band has bought into. The lyric “we fell in love at 19, and I was staring at a screen”, seems to express skepticism at the notion that two people typing on a keyboard, can engage in the kind of love with Winn Butler and the band view as worthwhile. And furthermore, are you really ‘breaking free’ through partaking in this internet-fueled effort kindly brought to you by Google? In order to take part you’ve had to connect your tablet and phone to your computer through a cable and password. You’ve effectively already given Google highly specific information about your equipment and tastes. Since the video links computers and preference, this experiment has provided Google with a valuable insight into a key demographic: the young, tech-savvy consumer who typically listens to Arcade Fire. Engaging with this video forces you to swap privacy for access – the exact process that you go through when signing into browsers like Google Chrome. But fear not, because Google allows you to access the info that you, want when you want it. We all want to stay connected. We all want to share and create. Arcade Fire gets this. Their video knowingly entwines us in this bargain – privacy for access, before turning it on its head by thematically and practically severing the computer-tablet linkage that they initially implored us to make. We’re left short-changed – we were promised complete control over the video and the freedom to create and be creative, we’re instead presented with a shallow alternative cleverly masked by an attractive digital sheen. I want to be clear that this is only my interpretation. Agree or disagree, I’d like to hear your opinion on it. This entry was posted in Blogging, Entertainment, Internet, Media, Music, News, Opinion, Pop Culture, Technology and tagged Aaron Koblin, Anti-Internet, Anti-Technology, Anton Corbijn, arcadefire, Facebook, Google, Google Chrome, music, Music Video, Neon Bible, Reflektor, Reflektor Video, Wilderness Downtown, YouTube. Bookmark the permalink. Has PR Led To The Death Of Journalism? I�m impressed, I have to admit. Really rarely do I come across a blog that�s each educative and enjoyable, and let me tell you, you have struck the claw on the go. Your idea is outstanding; the issue is something that not enough everyone is speaking smartly about. I’m very happy that we stumbled across this in my look for something concerning this.